The pH Miracle Non-Electric WaterMark Ionizer is an amazing affordable product which will produce high-quality alkaline water and improve water by reducing the molecular cluster size of the water molecules. This creates greater surface area and charge, increasing the electrical/ionic charge of the water or what is called Oxidative Reduction Potential (ORP). This molecular change is noticeable by the wonderfully soft texture and crisp clean taste of WaterMark water. This benefit is achieved by WaterMark’s vortex action. Water is sent through a vortex tube where it is spun around charged crystals, which creates major improvements to the structure of the water—similar to the action of a water fall which creates the same result. Moving, living waters are far healthier than stagnant bottled or other waters. Holiday Price: $580.00 plus free shipping. 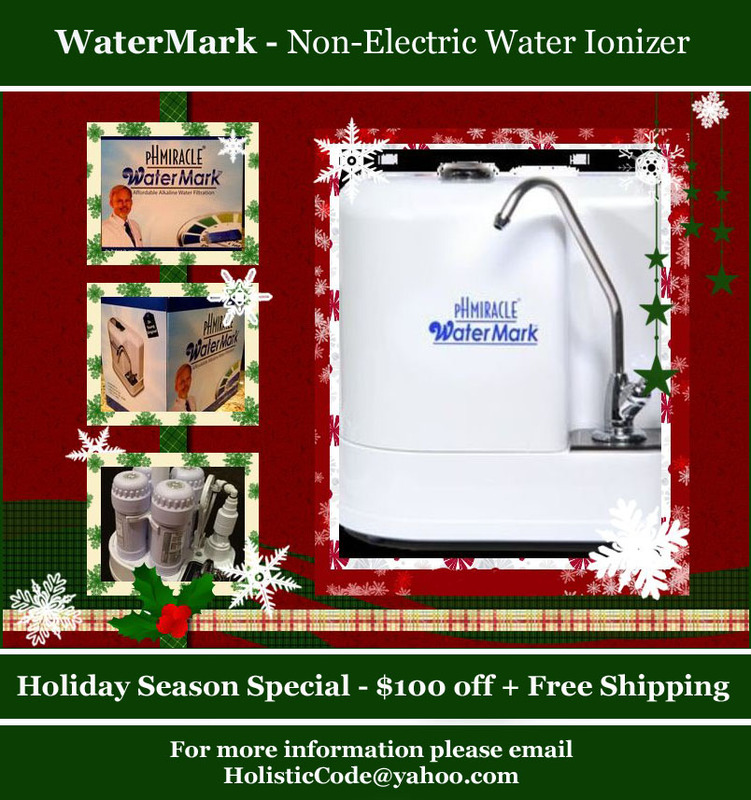 This Holiday Season Give the Gift of Health – A Water Mark Affordable Water Ionizer! So, how cool is this! I love new products and the pH Miracle Living Center has one here for you that makes for a better fit for many of you reading this now. This is the new pH Miracle Water Mark. Just in time for the holidays. This would make a fantastic gift for anyone and you will be on target for thekick-off of the New Years Cleansing Fast. The answer: The results and benefits of the Water Mark are equal to the top-quality water supplied by electric water ionizers. The Water Mark is great because it will produce high-quality, superior water at a more affordable price and without electricity.